Convenient dry cleaning & laundry services are now a click away. Download the Prestige Cleaners App to enjoy the easiest way to get your dry cleaning and laundry done in Scottsdale. Access an array of high quality services at your fingertips. Easily schedule complementary pick up and delivery. Check your order status. Get notifications when your order is ready and access exclusive savings, and more. For over 50 years, your hometown Scottsdale, Arizona, dry cleaner has provided outstanding dry cleaning, laundry, wedding gown care, and alteration services in Arizona. 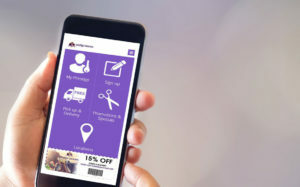 We’re continuing to lead the way with our innovative app, which offers unlimited access to dry cleaning and laundry on the go. Schedule Free Pickup & Delivery: Select your pickup dates and a friendly Prestige driver will come to your home or office, at no extra charge. We’ll even give you VIP Express Bags. Check Order Status: Check the status of your orders, get handy email reminders about your orders, and update your contact and payment information. Access to Exclusive Perks: Access exclusive promotions and savings only available on the Prestige App. You don’t have to worry about clicking or printing coupons. Find a Prestige Near You: It’s easy to find the Prestige Cleaners location nearest you for your dry cleaning, laundry, and alterations needs. Get a map, directions, and phone numbers directly through the app. Downloading the Prestige App is easy. Click below.